Each day 150 000 workers commute to Helsinki metropolitan area and back. Each year 9M passengers take 2 hour ferry trip between Finland and Estonia. 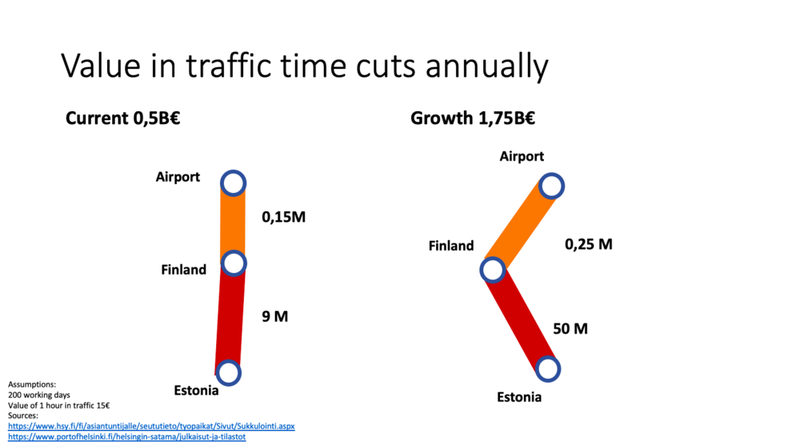 How about if we can cut travel time from outskirts of Vantaa to Helsinki City by 20min during rush hour and cut 2h ferry trip to 20min. And value each hour to 15€. Assume there are 200 working days in a year. What we can gain? So when we there is no fast train connections we as a society loose 525M annually just by sitting in cars and ferries instead of a bullet train. What if the metropolitan area grew in the future and there would be 250 000 commuters and 50M trips between Finland and Estonia. Please do acid test and take half off: still we are talking about quarter of a billion annually. This is a view from Finest Bay Area Project to estimate societal benefits of the tunnel.